Why Horror? is a feature POV documentary following horror fan and friend Tal Zimerman as he delves into the psychology of this frequently maligned genre. As he puts it on his site, “Horror entertainment instantly attracts or repulses audiences. And yet, it’s a global phenomenon.” It’s a bit like metal in that regard (for another excellent film, check out fellow Torontonian Sam Dunn’s Metal: A Headbanger’s Journey). They’re both transgressive and aggressive and have to be nearly explained away. And in both cases, you remember where you were the day you experienced them. In my case, it was Iron Maiden’s The Number of the Beast and for gore, the Tobe Hooper 70s classic The Texas Chainsaw Massacre. I was around 13, at my buddy Ari’s place with a bunch of friends and we managed to snag a copy from a North York strip plaza rental place, whose owner was indifferent to our age. Yes, pre-‘net trying to score a horror fix was tough. With typical teen bravado we lamented how lame Texas was, expecting to see chainsaws carving through connective tissue. Hooper’s subtleties were lost on us but that kick-started an interest in extreme cinema that continues to this day. What makes horror so special is that it exists on two fronts: one, the socially acceptable variety like Annabelle — tame, lacking the misogynistic tendencies of the genre, a low or absent body count, gore ratcheted down to a minimum. In short, dull. Not shoving people’s psychology to the limit like you would if you were to include the above. At the other end, the Martyrs of the world, or the New French Extremism movement, which takes its cues from the likes of Salò, or the 120 Days of Sodom. Martyrs is close to unwatchable it is so depraved. Somewhere in the middle is our level of dis(comfort). What people who denigrate the genre fail to appreciate, is the sheer variety. Personally (Chris), I prefer the biological horror genre, while Jeff’s tastes are a bit different. There are several things that appeal to me about this subgenre: one, I studied life sciences as an undergrad, two, I like it when authority figures in government are questioned and three, the horror is often two-pronged. On the one hand, some sinister virus may break out and on the other, the government might impose a curfew or implement a quarantine. Your safety might be compromised more by the latter, especially when they’re under shoot-to-kill orders. It’s a fascinating moral question about whether the government can or should sacrifice its own to prevent the spread of some lethal bug. In an infamous real-world example, substitute a pathogen for imperialism. In 1940, Sir Winston Churchill ordered the bombing of the French fleet in North Africa, sending 1400 sailors to their watery graves. Churchill feared the Gallic fleet would fall into Nazi hands and offered the French a deadly ultimatum. Anyway, whatever floats your boat, horror has something to offer. Hell, who are we to begrudge the likes of well, The Grudge? (or for that matter, Annabelle). To each his/her own. And as we’ve mentioned on numerous occasions here: horror doesn’t need a plot, doesn’t necessarily need good acting (in fact, not having it can provide much needed relief) or a choice script. All it needs to deliver is fear. 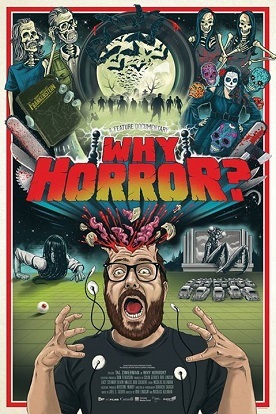 Why horror? Everyone’s got their own reasons. What about yours? This entry was posted in Documentaries and tagged 2010s movies, Canadian film, horror directors by Really Awful Movies. Bookmark the permalink.